The Serpentine Gallery Pavilion is the best show in London every summer. Forget Renzo Piano's Shard skyscraper and Norman Foster's Gherkin in downtown London. They'll be there for decades. Even that big Ferris wheel, the London Eye, has become a permanent tourist destination. Not so for what may be the best modern architecture in London. Every summer since 2000, Serpentine Gallery at Kensington Gardens has commissioned internationally famous architects to design a pavilion on the grounds near the 1934 neoclassical gallery building. These temporary structures usually function as a cafe and venue for summer entertainment. But, while the art gallery is open all year, the modern Pavilions are temporary. At the end of the season, they are dismantled, removed from the Gallery grounds, and sometimes sold to wealthy benefactors. 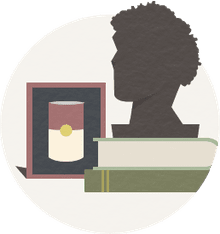 We are left with the memory of a modern design and an introduction to an architect who may go on to win the esteemed Pritzker Architecture Prize. This photo gallery lets you explore ALL the Pavilions and learn about the architects who designed them. Look fast, though — they'll be gone before you know it. The first summer pavilion designed by Baghdad born London-based Zaha Hadid was to be a very temporary (one week) tent design. The architect accepted this small project, 600 square meters of usable interior space, for the Serpentine Gallery's summer fundraiser. The structure and public space was so well-liked that the Gallery kept it standing well into the autumn months. Thus was born the Serpentine Gallery Pavilions. "The pavilion was not one of Hadid's finest works," says architecture critic Rowan Moore of The Observer. "It wasn't as assured as it might have been, but it pioneered an idea – the excitement and interest it aroused got the pavilion concept going." The Zaha Hadid architecture portfolio shows how this architect went on to become the 2004 Pritzker Laureate. Architect Daniel Libeskind was the first Pavilion architect to create a highly reflective, angular designed space. The surrounding Kensington Gardens and the brick-clad Serpentine Gallery itself breathed new life as reflected in the metalic origami concept he called Eighteen Turns. Libeskind worked with the London-based Arup, structural designers of the 1973 Sydney Opera House. Libeskind became well-known in the U.S. as the architect of the Master Plan to rebuild the World Trade Center after the 2001 terrorist attacks. Like Daniel Liebeskind before him, Toyo Ito turned to Cecil Balmond with Arup to help engineer his temporary contemporary pavilion. "It was something like a late-Gothic vault gone modern," architecture critic Rowan Moore said in The Observer. "It had, in fact, an underlying pattern, based on an algorithm of a cube that expanded as it rotated. Panels between the lines were solid, open or glazed, creating the semi-internal, semi-external quality that is common to almost all the pavilions." Toyo Ito's architecture portfolio shows some of the designs that made him the 2013 Pritzker Laureate. Oscar Niemeyer, the 1988 Pritzker Laureate, was born in Rio de Janeiro, Brazil on December 15, 1907 — which made him 95 years old in the summer of 2003. The temporary pavilion, complete with the architect's own wall drawings, was the Pritzker winner's first British commission. For more exciting designs, see the Oscar Niemeyer photo gallery. "The concept intends to forge a stronger relationship between the pavilion and the Gallery, so that it becomes, not a separate structure but, an extension of the Gallery. By subsuming the current building inside the pavilion, it is transformed into a mysterious hidden space." Two Pritzker Laureates collaborated in 2005. Álvaro Siza Vieira, 1992 Pritzker Laureate and Eduardo Souto de Moura, 2011 Pritzker Laureate, sought to establish a "dialogue" between their temporary summer design and the architecture of the permanent Serpentine Gallery building. To actualize the vision, the Portuguese architects relied on the engineering expertise of Arup's Cecil Balmond, as had Toyo Ito in 2002 and Daniel Liebeskind in 2001. By 2006, the temporary Pavilions in Kensington Gardens had become a place for tourists and Londoners to enjoy a cafe respite, which is often problematic in the British weather. How to you design a structure that is open to the summer breeze but protected from the summer rain? Dutch architect and 2000 Pritzker Laureate Rem Koolhaas designed "a spectacular ovoid-shaped inflatable canopy that floated above the Gallery's lawn." This flexible bubble could readily be moved and expanded as needed. Structural designer Cecil Balmond from Arup assisted with the installation, as he had for many past Pavilion architects. Pavilions up to this point had been single-story structures. Norwegian architect Kjetil Thorsen, of Snøhetta, and visual artist Olafur Eliasson (of New York City Waterfalls fame) created a conical structure like a "spinning top." Visitors could walk up a spiral ramp for a bird's-eye view of Kensington Gardens and the sheltered space below. Contrasting materials—dark solid timber seems to be held together with curtain-like white twists — created an interesting effect. Architecture critic Rowan Moore, however, called the collaboration "perfectly nice, but one of the least memorable." Frank Gehry, the 1989 Pritzker Laureate, stayed away from the curvy, shiny metallic designs he had used for buildings like the Disney Concert Hall and the Guggenheim Museum in Bilbao. Instead, he took inspiration from Leonardo da Vinci's designs for wooden catapults, reminiscent of Gehry's earlier work in wood and glass. 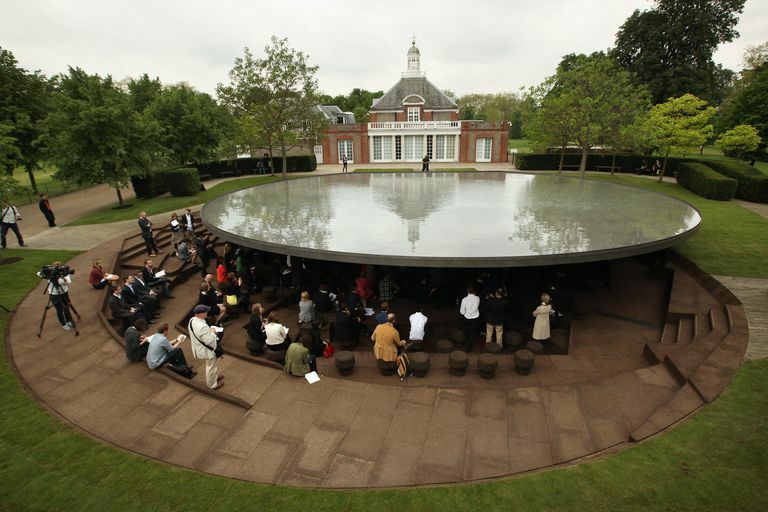 The 2010 Pritzker Laureate team of Kazuyo Sejima and Ryue Nishizawa designed the 2009 pavilion in London. Working as Sejima + Nishizawa and Associates (SANAA), the architects described their pavilion as "floating aluminium, drifting freely between the trees like smoke." The work of Jean Nouvel has always been exciting and colorful. Beyond the geometric forms and mix of construction materials of the 2010 pavilion, one sees only red inside and out. Why so much red? Think of the old icons of Britain — telephone boxes, post boxes, and London buses, as transitory as the summer structure designed by French-born, 2008 Pritzker Laureate Jean Nouvel. The Swiss born architects Jacques Herzog and Pierre de Meuron, 2001 Pritzker Laureates, collaborated with the Chinese artist Ai Weiwei to create one of the most popular installations of 2012. The Japanese architect Sou Fujimoto (born in 1971 in Hokkaido, Japan) used a 357-square meter footprint to create a 42-square meter interior. The 2013 Serpentine Pavilion was a steel frame of pipes and handrails, with 800-mm and 400-mm grid units, 8-mm white steel bar barriers, and 40-mm white steel pipe handrails. The roof was made up of 1.20 meter and 0.6 meter diameter polycarbonate discs. Although the structure had a fragile look, it was fully functional as a seating area protected with 200-mm high polycarbonate strips and anti-slip glass. The architect tells us at the press conference, "Don't think too much. Just accept it." Chilean architect Smiljan Radić (born 1965, Santiago, Chile) has created a primitive-looking fiberglass stone, reminiscent of the ancient architecture at Stonehenge in nearby Amesbury, UK. Resting on boulders, this hollowed shell — Radić calls it a "folly" — is one in which the summer visitor can enter, sit, and get a bite to eat — public architecture for free. The 541-square meter footprint has a 160-square meter interior filled with modern stools, chairs, and tables modeled after the Finnish designs of Alvar Aalto. The flooring is timber decking on wood joists between structural steel and stainless steel safety barriers. The roof and wall shell is constructed with a glass reinforced plastic. Design ideas usually do not come out of the blue but evolve from previous works. Smiljan Radić has said that the 2014 Pavilion developed from his earlier works, including the 2007 Mestizo Restaurant in Santiago, Chili and the 2010 papier-mâché model for The Castle of The Selfish Giant. SelgasCano, established in 1998, took on the task of designing the 2015 pavilion in London. Spanish architects Jose Selgas and Lucia Cano both turned 50-years-old in 2015, and this installation may be their most high-profile project. Their design inspiration was the London underground, a series of tubular passageways with four entrances to the interior. The entire structure had a very small footprint — only 264-square meters — and the interior was only 179-square meters. Unlike the subway system the brightly-colored construction materials were "panels of a translucent, multi-coloured fluorine-based polymer (ETFE)" on structural steel and concrete slab floor. Like many of the temporary, experimental designs from previous years, the 2015 Serpentine Pavilion, sponsored in part by Goldman Sachs, has received mixed reviews from the public. The Danish architect Bjarke Ingels plays with a basic part of architecture in this London installation — the brick wall. His team at the Bjarke Ingels Group (BIG) sought to "unzip" the wall to create a "Serpentine wall" with occupiable space. The 2016 pavilion is one of the larger structures made for the London summer even — 1798 square feet (167 square meters) of usable interior space, 2939 square feet of gross internal space (273 square meters), within a footprint of 5823 square feet (541 square meters). The "bricks are really 1,802 glass fiber boxes, approximately 15-3/4 by 19-3/4 inches. "This unzipping of the wall turns the line into a surface, transforming the wall into a space....The unzipped wall creates a cave-like canyon lit through the fibreglass frames and the gaps between the shifted boxes, as well as through the translucent resin of the fiberglass....This simple manipulation of the archetypal space-defining garden wall creates a presence in the Park that changes as you move around it and as you move through it....As a result, presence becomes absence, orthogonal becomes curvilinear, structure becomes gesture, and box becomes blob." Many of the architects who design the summer pavilions at London's Kensington Gardens seek to integrate their designs within the natural setting. The architect of the 2017 pavilion is no exception — Diébédo Francis Kéré's inspiration is the tree, which has acted as a central meeting place in cultures around the world. Kéré (born in 1965 in Gando, Burkina Faso, West Africa) was trained at the Technical University of Berlin, Germany, where he has had an architecture practice (Kéré Architecture) since 2005. His native Africa is never far from his working designs. "Fundamental to my architecture is a sense of openness," says Kere. "In Burkina Faso, the tree is a place where people gather together, where everyday activities play out under the shade of its branches. My design for the Serpentine Pavilion has a great over-hanging roof canopy made of steel with a transparent skin covering the structure, which allows sunlight to enter the space while also protecting it from the rain." Wooden elements under the roof act like tree branches, providing protection for the community. A large opening in the canopy's top collects and funnels rainwater "into the heart of the structure." At night, the canopy is illuminated, an invitation for others from faraway places to come and gather in the light of one community. Frida Escobedo, born in 1979, Mexico City, is the youngest architect ever to participate in the Serpentine Gallery Pavilion in London's Kensington Gardens. The design of her temporary structure — free and open to the public in the summer of 2018 — is based on the Mexican inner courtyard, combining common elements of light, water, and reflection. Escobedo pays homage to cross-cultures by using British natural resources and building materials as well as placing the inner walls of the pavilion — the celosia or breeze wall found in Mexican architecture — along the Prime Meridian of Greenwich, England. The lattice wall, made of traditional British roof tiles, follows the line of the summer sun, which create shadows and reflections in interior spaces. The architect's intent is "the expression of time in architecture through inventive use of everyday materials and simple forms." 2013 Lawn Programme Press Pack 2013-06-03 FINAL (PDF at http://www.serpentinegallery.org/2013%20LAWN%20PROGRAMME%20PRESS%20PACK%202013-06-03%20FINAL.pdf), Serpentine Gallery website [accessed June 10, 2013]. ALL PHOTOS ©Loz Pycock, Loz Flowers on flickr.com, Attribution-CC ShareAlike 2.0 Generic. Thank you, Loz! Serpentine Pavilion 2014 Designed by Smiljan Radić, Serpentine Gallery Press Pack 2014-06-23-Final (PDF at http://www.serpentinegalleries.org/sites/default/files/press-releases/2014-06-23PavilionPressPackwithSponsors-%20Final.pdf), Serpentine Gallery website [accessed June 29, 2014]. Is Frank O. Gehry really a pain in the architecture?